British Summer Time is officially upon us, and the lighter and (hopefully) milder evenings encourage the sampling of nice beer in alfresco settings. It’s handy then that there are plenty of beer festivals in London in April that make good use of beer gardens or other outdoor spaces. Celebrate spring by visiting some of them (but take an umbrella just in case). As always, let us know in the comments if we’ve missed anything. The Clapham branch of Craft Beer Co states that its Craft 100 event, which kicks off this Thursday, will be “London’s biggest ever pub beer festival”. It’s an interesting claim, the veracity of which may depend on how exactly you decide to measure the size of such an thing. However, their intention to have 100 (cask and keg) beers available simultaneously might indeed be an unmatched feat for London pubs, and is made even more appealing by the promise of about one third of the beers being exclusive to (or launched at) this festival. There’s no entry fee, but you’ll have to buy a glass for £3 if you want to get involved. 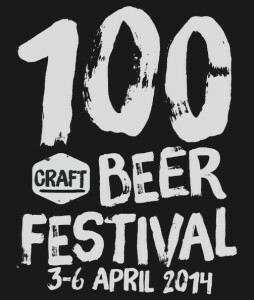 See the Craft 100 website for more details, including a full beer list. If Craft 100 is not your scene (or your side of London), the Waltham Forest Sports & Social Club’s 12th Real Ale Festival offers a smaller-scale option over the same dates. Focussing on beers from the West Country, the festival promises 20 real ales, ciders and perries, and live music on Friday and Saturday evenings. Admission is free for club or CAMRA members, or £2 for non-members (£4 after 7pm on Saturday). Even more choice for drinking beer this weekend: if you’re in the Watford area between 6pm on Friday and 6pm on Sunday you might want to check out the Fullerians RFC Annual Beer Festival. The published beer list features 20 real ales and 10 ciders, and includes an interesting balance of familiar pub stalwarts (mostly from Wells and Young’s) and some less common ales from smaller regional brewers. Classic beer-soaking food will be available, including piggy excellence from GBBF favourites the Crusty Pie Company. Music will be provided by several live bands, and Sunday will feature various inflatable family-friendly attractions. A scout hut on the southern side of Surbiton is host to the annual Hook Beer Festival, a CAMRA-supported event promising a few dozen real ales and a good handful of ciders. A £5 ticket, available online (or at a couple of local pubs), gets you entry to one of three sessions, a pint glass and a programme. More details are available on the festival’s website. Details are sparse on this one, but the Fox in Hanwell will host their annual Easter Beer Festival over the Easter bank holiday weekend, offering “good food, live music and plenty of beer”. The pub is a CAMRA favourite, so expect a good range of real ales. London’s only pub owned by the Hop Back brewery also hosts a beer festival over the Easter bank holiday weekend. Hidden away on a South Wimbledon backstreet, the Sultan is worth seeking out, and their Easter Beer Festival promises 20 different beers, an outside barbecue and live music. They’re not really beer festivals in the traditional sense (despite their marketing), but pub chains JD Wetherspoon and Nicholsons are both promoting their own beer events, whereby some of their pubs stock ranges of beer that fit a certain ‘theme’. The theme for JD Wetherspoons (until 13 April) is ‘international real ale’ (PDF); for Nicholsons it is, predictably, ‘spring beer’ (until 19 April). Consult their websites to find a participating pub. If you’re a lover of beer or pubs, why not buy the Londonist book of London pub crawls for less than the price of a pint.